About 90 million Americans suffer from snoring during sleep, and about half may suffer from a serious sleep disorder called Obstructive Sleep Apnea (OSA). For everyone getting nudged or elbowed throughout the night from frustrated bed partners, it’s important to know what their snoring means, and how they can silence it. Snoring can and often should be treated – for the sake of the snorer and their partner. 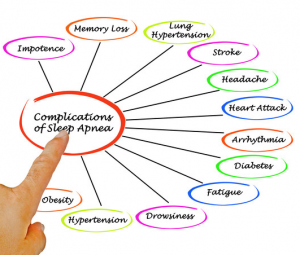 Snoring and sleep apnea can have serious health ramifications. It can trigger the release of stress hormones, change how your body uses energy, and make you feel tired and sleepy during the day. In addition, inadequate sleep lead to weight gain, memory loss, skin aging and more. There is further evidence that OSA leads to a greater risk of high blood pressure, heart attack, stroke, congestive heart failure, atrial fibrillation, diabetes, certain cancers and even sudden death. Treating either condition can decrease these risks. And let’s not forget that while you’re sleeping, your partner may not be. Relationships can severely suffer when a partner continues to be awakened or is forced to sleep in another room. The lack of sleep or need for nighttime separation can foster resentment and decrease intimacy in relationships. With your doctor’s approval, a custom-fit oral sleep appliance can improve your sleep, restore your alertness, revitalize your health, and make your loved ones very happy as well.